Geoff ‘Henry’ Lawson’s cricketing career has been described as magnificent, brave, controversial and colourful. Born and raised in Wagga Wagga, New South Wales, Geoff moved to the big city in 1976 to attend the University of New South Wales. He was trained in optometry and like any good fast-bowler he suffered from tunnel vision, red mist and blind spots. A tall and pacey outswing bowler, Geoff gained attention in 1978/79 when he was awarded the Ritchie Benaud Player of the Year in his first season in Sydney. The following year he was named the Young Australian Cricketer of the Year. During a time when While World Series cricket was dominating the cricket landscape, Lawson made his debut for New South Wales against Western Australia at the SCG. He would take 395 wickets for NSW over a record 115 Sheffield Shield games with the great Clarrie Grimmett the only player to take more Sheffield Shield wickets. ‘Henry’, as he is affectionately known in reference to the great Australian poet Henry Lawson, made his Australian Test debut in 1979 as a replacement for the injured Allan Hurst. He would participate in 12 Australian tours including: England four times, India three times, Pakistan twice, the West Indies, New Zealand and Sri Lanka. Geoff captained NSW on 40 occasions between 1988/89 and his retirement in 1991/91. His philosophy of ‘get on or get out’ won numerous state titles and was a strong influence on the captaincy styles of former Test captains Steve Waugh and Mark Taylor. Geoff has stayed close to the game as an analyst and spectator. He had a stint as the coach of Pakistan between 2007 and 2008. 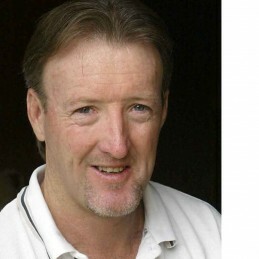 Since retirement from the field, Geoff has commentated for Channel Nine, ABC radio and Fox Sports and is a panelist on cricket show At the Wicket. Geoff has written weekly columns for the Sydney Morning Herald and the Sun Herald as well as features in magazines in Australia, England and India. In the past 20 years he is also the only cricketer to have written his autobiography without the aid of a ghost writer. Geoff Lawson has had a career filled with success between international elite sport, academia and business. His recovery from a crippling back injury is a testament to his strength of character and will. Geoff speaks on a range of topics using anecdotes to compare elite sport with business, teamwork, leadership, and discipline.